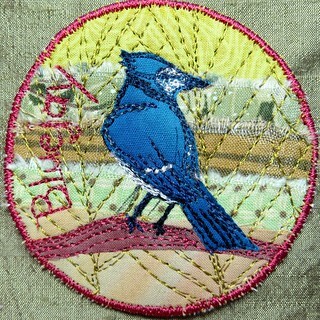 A bluejay for you in the middle of the last whirlwind of packing. I'll leave tomorrow around lunchtime, stay with friends for the night, and hammer up the coast on Sunday. It is still hot, but with Alice off to NYC to fold paper, Aerin and I have let the air-conditioner rest, and made do with fans. Aerin would like to be a tropical girl. Alice and I are both polar people. Air conditioning makes us polar people happier, but Aerin sits on the end of the couch under a pile of blankets with her lips turning blue. So. Warmth today. Also a couple thunderstorms, just to shake things up. Common ???? Really wonderful ! I wish we had these blue ones over here …. our Jay only has tiny specks of blue on his wings. Wish you all the best with the weather ! Has Alice watched “Between the Folds”? It’s a good documentary about origami. I like your birds, a lot!